Did you know the Bridge over the River Kwai actually exists in Thailand? If you’re interested in visiting it read on. 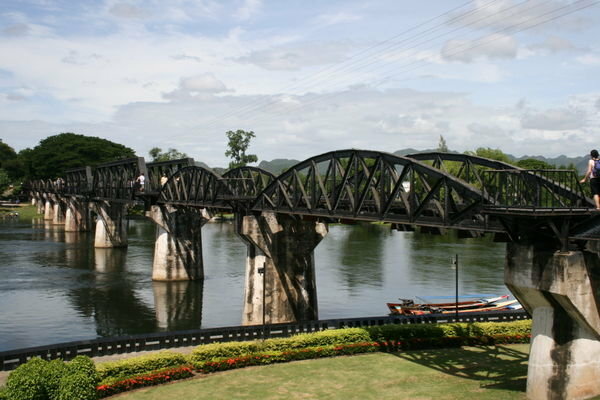 Mention the Bridge over the River Kwai and most people are reminded of the film; however, the film was based on a true story which took place in Thailand and the bridge itself still stands today in a small place called Kanchanaburi. Kanchanaburi is located approximately 120 km north of Bangkok and is accessible by either train or car. Kanchanaburi was the place where thousands of allied troops were kept in internment camps during the Second World War. The allied POW’s were forced to work on a railway that connected Thailand to Burma part of which meant making a bridge over the River Kwai. Kanchanaburi is easily accessible by train from two stations in Bangkok: Bangkok Noi station and Haa Lampang station. In reality the actual bridge over the River Kwai which still stands today looks nothing like the one shown in the film and in fact the bridge itself doesn’t cross the River Kwai but a much smaller tributary near the main river. Nearby the site of the bridge is a war cemetery containing the remains of some 7,000 allied soldiers who died in Japanese internment camps. The bodies of soldiers are buried according to nationality and includes British, Australian and Dutch soldiers. The cemetery is open daily from 8.30am until 6pm and admission is free. This small but informative museum is dedicated to the POW’s who worked on the railway during the Second World War. Exhibits include various artifacts, photos of POW’s as well as some moving letters written by the soldiers who were interned here. This museum provides a good overview of the situation in Thailand during the Second World War and includes informative photographs and maps explaining the history of the POW camps in Thailand. Not related to the war at all, but still worth a visit if you are already in the area is the Tiger Temple which is a nature park in which wild tigers and various other rare animals live.